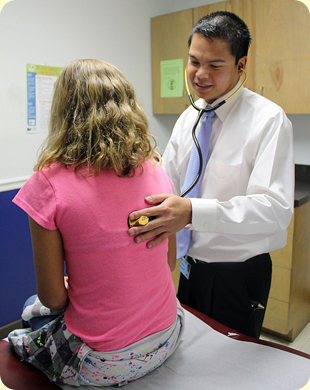 At Knox Clinic Pediatrics, our primary concern is the health and well being of our patients. We try to manage our schedule so we can be available to tend to illness and emergencies that arise. Sick visit walk-ins are welcome, but it is best to call ahead for an appointment. Walk-ins will be worked into the schedule as time permits, on a first-come, first-seen basis unless a patient has a true emergency condition. The nurse will assess the child and we will see that child earlier only if it is truly an emergency. Usually, we have many children to be seen as sick visit walk-ins. We serve many children in a day and all appointment times are needed to accommodate every child's needs. We try very hard to schedule our patients according to their needs and try to keep waiting to a minimum. Please understand this, and respect those who have made an appointment. All payment or co-payment is due at the time of service, unless other arrangements have been made in advance. We accept most major insurance plans; however, please call our office to verify that your insurance is among those we accept.